I’m generally much of a sports fan, but I do follow, rodeo, football and hockey. And while I don’t often employ sports analogies, ‘skating to the puck’ is a good one. It implies that the player must anticipate where the puck is going and be at the right place at the right time to make the winning play. ss audiences in Indonesia, Turkey, Nigeria, Morocco, and Algeria because while only Algeria has been in the news with respect to Al Qaeda (e.g. Washington Post @ http://www.washingtonpost.com/wp-dyn/content/article/2007/05/29/AR2007052901967.html) the other nations are critical to global long term peace and prosperity. Indonesia faces a myriad of issues and the USG clearly should have messaging that addresses many of them. Furthermore Indonesia’s role in Asia will become more pivotal as China’s political, economic and military influence continues to grow. Indonesia must receive significant strategic communications attention as a prophylaxis to alleviate potentially serious issues in the future. USG strategic communications will of necessity combine Department of State and Department of Defense information engagement efforts. As a core principle of democracy, the Executive Branch’s civilians drive Strategic Communications under the direction of the Ambassador in line with guidance from the President and Secretary of State Clinton. Admiral Timothy J. Keating, Commander of the Pacific Command has a number of informational resources at his disposal as does the Commander of the US Special Operations Command. These DOD resources ought to be ‘de-conflicted’ so that they are additive in effect. After all marketing is cumulative. These efforts will likely include traditional media and the Internet. Given the burgeoning growth of mobile phones in Asia, campaigns employing Text Messages, e-mails and social networking are also appropriate especially to reach the young adult population which is a very large chunk of the overall population. Time in the posting does not permit an analysis of other countries and their potential for strategic communications. Suffice it to say that Turkey is critical the US and global security so that it should be singled out for special attention as well. 1. Fundamentalist dictatorships will never acquiesce to their people’s wishes. 2. Support of fundamentalist regimes can lead to violence against citizens who dare to oppose them. 3. In times of stress Fundamentalist dictatorships will do all they can to limit communications. State media will often be the only ‘authorized’ media covering events. Those seeking to let the outside world know the truth will have to rely on technology and creativity to get their messages out and wills subject to personal peril. 1. The Internet and amateurs may be one of the few ways to transmit messages and images from forbidden/denied areas and incidents. 2. Covert cameras need to be employed during incidents to reduce the chances of the communicator being singled out of a crowd. 3. Even the most repressive of governments (North Korea perhaps being an exception) cannot keep a total lid on negative images and communications flowing out of their countries. From a military PSYOP perspective harnessing the images and Internet exploitation of them should take several directions. A trans-regional campaign is in order to inform moderate Islamic audiences of the events unfolding in Iran and transmitting the messages I’ve noted above and others as appropriate. Tactical PSYOP production units should accumulate file footage (often called b-roll or background roll) to be used as needed later on. Training institutions such as SWC should develop case studies to be used in future PSYOP training and/or exercises based on two alternative scenarios. One scenario is that PSYOP forces are inside the country where the events are taking place and the other is that PSYOP forces are outside the country. 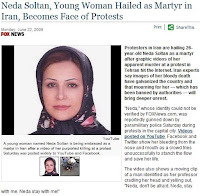 The second scenario would pose questions as to how or if these images and news stories coming out of Iran should be used elsewhere and if so how. Consideration should also be given in the use of covert cameras during hostile situations so that local images may be captured for subsequent use as well. This training should be provided out of DINFOS as well as SWC and other appropriate training venues. I would also recommend that PSYOP Groups assign an informal project team to keep track of the events in Iran and to search out, store and categorize the images and stories as they unfold. I have had a couple of weeks to savor the experience of Regimental Week at Fort Bragg and on reflect on the State of the PSYOP Regiment in general. To quote Dickens “These are the best of times, these are the worst of times.” The PSYOP Optempo is breathtaking. No matter your assigned POG, you are going to be a part of the war some time soon – and often thereafter. Reservists can expect to re-deploy 18 months after they return and the Optempo on the active side is intense as well. The fact that the 4th POG guidon is deployed down range is evidence of the PSYOP commitment to National Defense. PSYOP forces have experienced the tragedy of KIA and continue to prove their mettle on the battlefield. The Regiment has taken a giant first step with the first awarding of the Gold MG Robert A. McClure award to COL (R) Al Paddock; COL (R) Jeff Jones, COL (R)Frank King and LTC (R) Joseph Meisner. Each of these outstanding individuals has dedicated a life time to PSYOP and deserving of the award. While the maturation of the Branch through the award is a positive step forward, there is still much to do. At the top of my list is the need to reunite AC and RC forces under the same command. The split of command responsibility between USSOCOM and “the Big Army” is a mistake. As one well placed Pentagon official put it during branch week “there must be transparency of capability” to best serve the force. Hopefully DOD is moving ahead in this direction. Second is the need for community leadership through the CDR of POG troop units, the Regiment and PSYOP Associations. It is my belief that the POG CDR and the JMISC CDR must constitute the critical components of an informal Board of Directors who work in tandem with all the constituents including SWC for the betterment of the branch. SOCOM as the Proponent for PSYOP needs to exert itself through J39 and serve as the catalyst (and perhaps funder) to insure the evolution of the total community. Third is political action. It all happens on “The Hill” and we in PSYOP must model our ability to “inform” members of Congress about PSYOP to help insure PSYOP receives its appropriate share of the pie. Fourth is image building. All of us – those in uniform and out must work together to help build a positive image of PSYOP to once and for all remove the stigma of ‘propaganda’ and to clearly articulate the value of what we do everywhere from the battlefield to the Congress to wording of contracts. My personal congratulations to COL Curt Boyd on the completion of his outstanding tenure as CDR of the 4th POG and my best wishes to the incoming CDR, COL Carl Phillips on his assumption of Command next month. This week’s lead posting was supposed to be a thoughtful perspective about PSYOP Regimental Week last week at Fort Bragg. However, there is just too good of a target of opportunity to pass up. 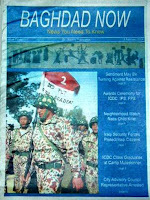 The article leads off by describing Baghdad Now, a newspaper that according to the article “has no publicly known editor, no bylines and no ads”. The article continues by saying that the paper is free and distributed by soldiers. Is this a giant waste of money or not? It should be obvious that Baghdad Now is not a ‘real’ paper because it doesn’t cost anything and doesn’t have any ads, but does that mean the entire effort is a waste of money? At the risk of sounding like an attorney, it depends. On the one hand there would appear to be a real credibility gap, but on the other, even if only a limited numbers of Iraqi’s read the paper hasn’t it accomplished something? Actually I think the money and energy could be better spent in other ways. There is a big difference between tactical PSYOP support to a particular operation or set of operations. For example, PSYOP in support of a cordon and search operation has a finite beginning and a clear end point. PSYOP support to induce an enemy force to surrender or to convince insurgents to leave the area also has concrete metes and bounds. These assignments are clearly the meat and potatoes of tactical PSYOP in general and US Army PSYOP in particular. However, these missions are in stark contrast to the loftier, more strategic goals of supporting the USG’s goals of bolstering the Iraqi government and insuring a secure environment as US troops withdraw. Publishing a newspaper even for an audience you know well is not easy. The financial woes of the US printed newspaper industry are not exclusively a US problem and attest to the difficulties facing this medium. Newspapers must give their readers a reason to pick them up. Local papers in particular are succeeding by providing local news that the regional or national media just can’t provide. Local politics, local social events, local religious celebrations and news of one’s neighbors are the stuff of well read local papers. Local papers also prominently publish obituaries because they are important to the community. A newspaper that only published fluff and generalities would quickly find itself out of business. Of course the Washington Post may not be presenting the full picture, after all their job is also to sell papers and stories about USG efforts that are going well or can’t be connected to the Abu Ghraib debacle won’t sell nearly as well as those that do. Having said, it seems to me that US influence efforts would be better spent in partnership efforts with existing credible media. The resulting product won’t be the everything is rosy approach of Baghdad Now, but the interaction with credible local journalists can ultimately develop into the relationships and journalistic philosophy necessary for an impartial reporting of the news or at least a less judgmental view that doesn’t tar all the actions of the Iraqi government or the US forces trying to support it. I’ve returned to Fort Bragg for PSYOP Regimental Week hosted once again by the 4th PSYOP Group. The week kicked off yesterday with a formal ceremony in a Group formation. I had never seen an entire PSYOP Group in one place before since Reserve units are scattered and only symbolic group formations are executed. It was an impressive sight. The mood was serious. The CDR’s exhortations to focus and esprit de corps echoed through the Pine trees. COL Boyd, the 4th POG CDR set the stage for PSYOP Regimental week by urging each soldier to make the most of the varied schedule through active participation. Events ranged from open houses to explain missions and accomplishments, to athletic events such as runs, a softball tournament, combatives and some not so traditional contests as speed chess and a Language skills event. Competitive events were complemented by lectures and presentations by experts in their fields and a host of social events culminating in a formal evening later in the week. I’m no longer surprised at how young soldiers look. However, I was surprised by their high level of poise and confidence. Assignments ranging from the dangerous to the highly political have produced a force that is smarter, more culturally agile and anxious to make a difference. Of particular note to me was the comparatively small number of female soldiers to the total. The number of female soldiers quite small compared to my years in PSYOP. Having said this, the exceptional contribution of female PSYOP soldiers seems geometrically out of proportion with their numbers. In speaking with several soldiers I’ve learned that they have worked in a variety of challenging situations requiring courage, intellectual flexibility and technical skills. In combat situations PSYOP female soldiers have distinguished themselves for bravery and dedication unparalleled in the branch’s short history. One such soldier routinely assisted combat forces on many missions to be able to deal with any female detainees. These missions were not part of her job description and were always ‘outside the wire’. She was rewarded with the Army Commendation Medal by being authorized to wear the combat patch of the unit she worked with – probably the only or at least one of the very few females ever being authorized to do so. One officer remarked that the authorization for that patch was the equivalent to the Bronze Star in other units. I would be proud and honored to have my granddaughter be a part of this elite group in the future.